High performance, robust and scalable technology is at the core of Admiral Markets. Built for low latency and high trading frequency, our system aggregates the flow from different banks and other venues into a single liquidity pool, allowing us to provide competitive spreads and deep liquidity. Average execution time – average time for executing an order calculated on the basis of all executed orders. The lower the value is, the better, as execution is faster and more accurate due to a reduced slippage probability. Average net slippage – mathematical expectation of slippage for any given trade. Calculated as summary slippage (either positive and negative) divided by total number of executed orders, e.g. : (0.003 – 0.001 + 0.001) / 3 = 0.001. The closer the value is to zero, the better. Positive value means that positive slippage is more likely to occur and vice versa.Pips – for avoidance of doubt, on this page we equate the pip to the tick size, i.e. the minimum increment of the price (e.g. 0.00001 for instruments quoted to the 5th place following the decimal point, 0.001 for the instruments quoted to the 3rd place following the decimal point etc). Average net slippage as percentage share of typical spread – mathematical expectation of slippage represented as a percent share of an instrument`s average spread, e.g. : 0.001 / 0.012 x 100 = 8.3%. The closer the value is to zero, the better. Positive value means that positive slippage is more likely to occur and vice versa. Trades with no slippage – percentage share of trades executed with no slippage (i.e. `at price`) in total number of executed orders. The higher the rate is, the better, as you can expect that the trade is more likely to be executed accurately at the requested price. Trades with positive slippage – percentage share of trades executed with positive slippage in total number of executed orders. The higher the rate is, the better, as you can expect that the trade is more likely to be executed at more favorable price than requested. Please also note that the percentage share of trades with positive slippage is statistically lower than the percentage share of trades with negative slippage. 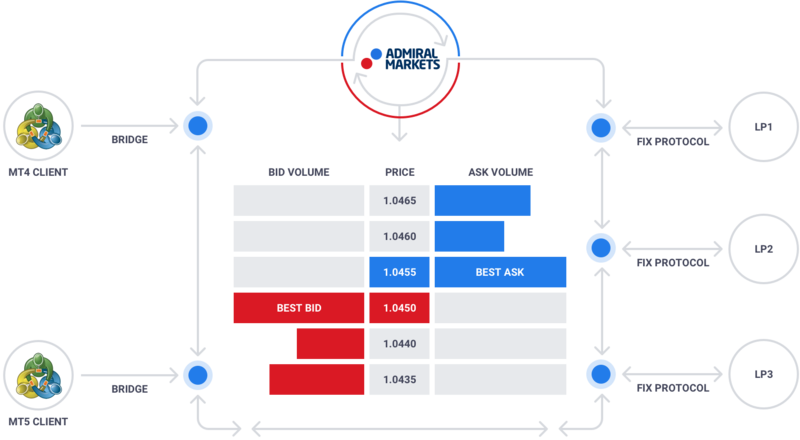 This is because the latter is affected by orders which exceed the volume of available best bids and offers, so they are executed at volume-weighted average prices. Trades with negative slippage – percentage share of trades executed with negative slippage in total number of executed orders. The lower the rate is, the better, as you can expect that the trade is less likely to be executed at less favorable price. Please also note that the percentage share of trades with positive slippage is statistically lower than the percentage share of trades with negative slippage. This is because the latter is affected by orders which exceed the volume of available best bids and offers, so they are executed at volume-weighted average prices. Rejected trades – percentage share of rejected trades in total number of executed orders. The lower the rate is, the better, as you can expect that the trade request is less likely to be rejected and not executed at all. The statistics provided on this page are calculated on the basis of all market orders executed by all Admiral Markets Group companies during current year on Admiral.Markets accounts.Please note that your personal trading experience may vary from the numbers provided above as the number of trades in one`s trading history may not be statistically representative.